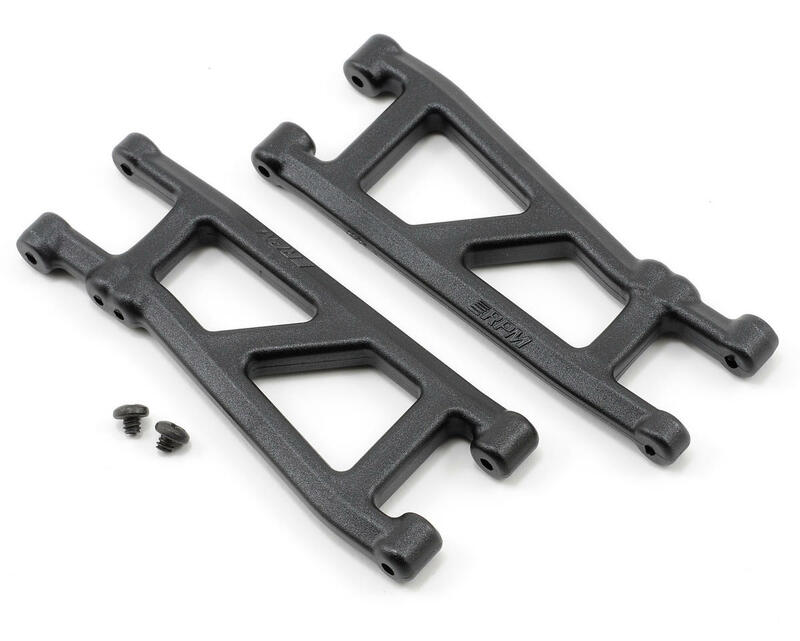 This is a set of RPM Rear A-Arms, and are intended for use with the Associated SC10 and T4 1/10 scale trucks. RPM SC10/T4 A-arms were designed to solve critical durability issues stemming from stock rear A-arms. These SC10/T4 rear A-arms are designed to withstand some serious abuse! RPM A-arms are over 25% thicker around the hinge pins than the stock versions which translates into pure RPM muscle to help eliminate damage during those “Wow, did you see THAT crash!” moments. Other design improvements include angled leading and trailing edges of the A-arms, which help the A-arms transition up and over objects much better than the blunt surfaces of the stockers. RPM also focused on the hinge pin retaining system used on the stock A-arms. Using a small screw hole so close to the hinge pin like the stock arms does weaken the A-arms. RPM moved the hinge pin retaining screws in-line with the hinge pins, significantly strengthening the A-arms in the process. By eliminating the smaller 2-56 hinge pin retaining screws, RPM also eliminated the problem of the hinge pins falling out due to varying screw head diameters. The final focus was on slop elimination. RPM's strict quality control allows them to tighten up all of their tolerances without fear of binding the suspension system. The final result is a smooth, free moving suspension system with minimal slop. The tighter tolerances on these A-arms allows other critical adjustments such as camber and toe angles to be much more consistent, providing better and more consistent control of the SC10 or T4. 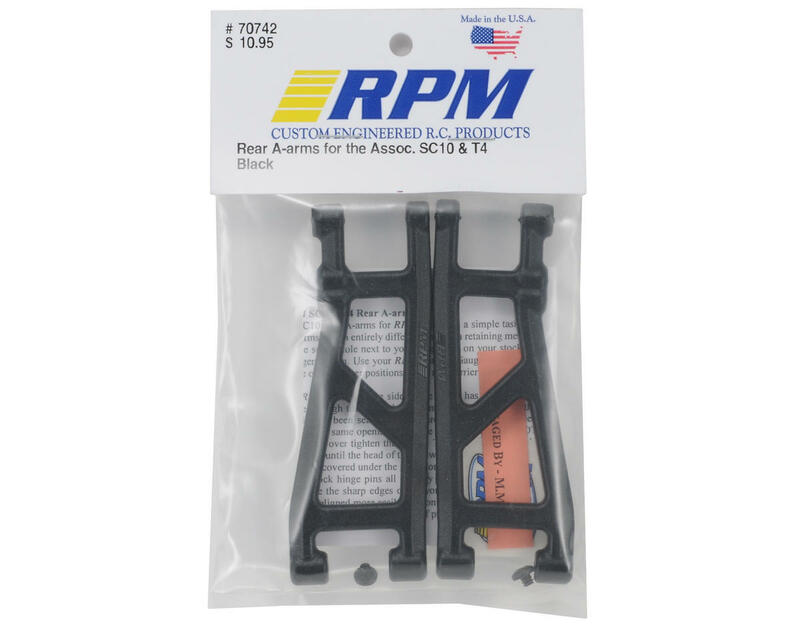 RPM SC10/T4 A-arms come with all necessary mounting hardware and instructions, are sold in pairs and are backed by RPM's industry-leading breakage warranty. Combine a set of RPM rear A-arms with a set of RPM front arms and if you crash, you’ll still finish your race, not your day! Nice solid arms - typical RPM quality, however, these don't have the ball to attach the Factory Team 9635 swaybar kit to. A hole on the inside back of the arm to put a ballstud would make this a perfect part, but because they don't have it, the RPM's will go in my toolbox as backups for when I break a stock arm. I run all rpm arms on my t4, I love them they will not brake like others the only bad thing is they flex a bit but I race on clay an outdoor and its not a big deal there awesome. I also run some other hopups of theres and had no problems at all, Awesome brand. This is a nice investment for the sc10 if u dont run swaybar. have these on mine after the stock ones keep ripping out where the pin slides through. they work well for me and give it a better look I think.